When the lock to your business or commercial space becomes damaged or stops working properly, it can seem like a huge dilemma. Luckily, a lock repair may be all you need! It may be difficult for you to know if you need a complete lock replacement or if you simply need a lock repair, but we can help you figure out which will be best for your commercial space. At 24/7 Emergency Locksmith, we offer a ton of different commercial locksmith services that can help you keep your business safe and secure. While some of your business’s lock issues may require a new lock installation, some may simply need to be repaired! Once you realize that your locks are working differently or not working properly, you should contact 24/7 Emergency Locksmith. The sooner you contact our locksmith experts about your lock problems the easier the lock repair will be! If you are in need of commercial locksmith services in the Lehigh Valley and surrounding counties, including Lehigh, Northampton, Montgomery, Berks and Bucks, 24/7 Emergency Locksmith can help! We know that you want to keep your business or commercial space secure. 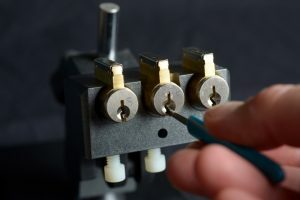 A lock repair can help keep your locks working properly and keep your business safe. Call 484-891-1922 today!